Imagine someone tells you there are going to be coordinated protests staged across the United States, all on one day, and that about 2 million Americans will participate by marching and rallying in the streets. You’d probably assume a massive political demonstration like this would dominate news coverage for at least the next day or two, but probably longer. It would seize the interest of the American public and be the most talked-about subject at the office water cooler, right? Not in 2018, it seems. If you felt like this year’s Women’s March barely registered as a blip on the zeitgeist radar, you’re not alone. I spent some time analyzing publicly-available data to try and find out why. Before I share what I found, I want to point out that just because the march(es) didn’t capture much public attention, that hardly means the event was ineffective politically. Organizers used the demonstrations to register new voters and mobilize prospective grassroots activists. The marches also sent a strategic message to campaigns: women voters are energized and ready to show up at the polls on election day. That said, I imagine organizers were hoping for more attention than they got. I started by looking at where the marches took place, and how many people participated. A public interest project called Crowd Counting Consortium, run by professors Jeremy Presman and Erica Chenoweth, has been aggregating and reporting on crowd size estimates since early last year. Best of all, they make the data freely available for download. 2018 Women’s March crowd side estimate data from Crowd Counting Consortium, which I manipulated then mapped using Tableau. 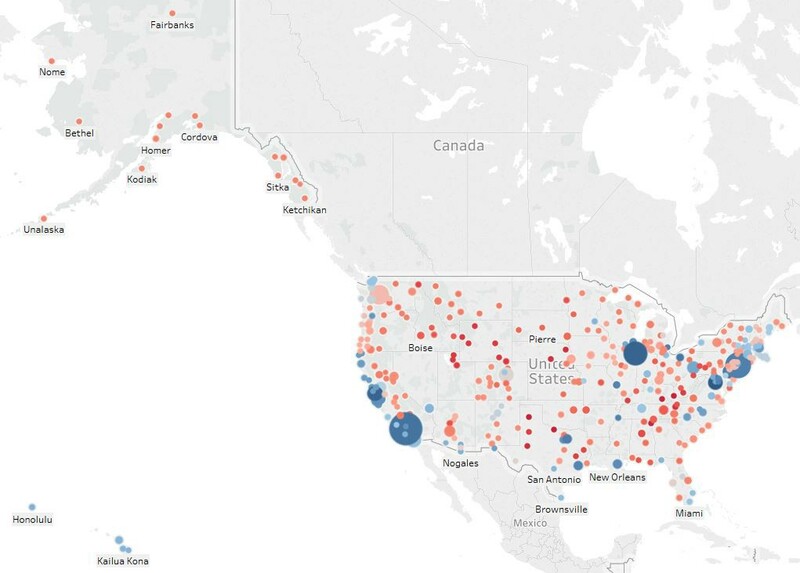 You can view the interactive map and download the data from Tableau Public. I used the 2018 Women’s March crowd attendance data set (which, as of 1/27/18 is still in “in progress,” but mostly populated), and used a service called geocod.io to geocode each city in the data set, then match it to the nearest congressional district. This allowed me to append presidential vote results from last year’s election to get a sense of how much support there is for Hillary Clinton (and, conversely, animosity toward Donald Trump) in the communities where the protests took place. I’ll be the first to admit this method is imperfect, since congressional districts, especially in metro areas, are often gerrymandered to favor one party. The city of Atlanta, for instance, geographically centers on a tail-like offshoot of CD11, a solidly Republican district representing the northwest suburbs; in reality, metro Atlanta as a whole is politically left-of-center. A similar issue appears with Seattle. This is merely a preliminary analysis, however; not a peer-reviewed scientific study. These types of imperfections come with the territory. Using Tableau Desktop, a data analysis and visualization application, I mapped the approximate location of each reported U.S. protest, excluding 38 sites where either (1) crowd size estimates were not yet published, or (2) the estimate was fewer than 10 people. That left 375 protest sites, with eat least one protest in each state. The larger the circle in the maps, the larger the estimated crowd size. Circles are red or blue based on whether the encompassing congressional district voted above (blue) or below (red) 50% for Hillary Clinton, with darker colors indicating low and high extremes in Clinton voting. The map below is closer detail of the contiguous 48 states plus D.C. I strongly encourage you to visit the interactive map I published on Tableau Public. Not only is it easier to understand what the circle sizes and colors represent, but you can also get detailed information about any site you hover over. Tableau users can download the workbook for further analysis. Marches in the contiguous 48 states plus D.C.; visit the interactive map for additional information. 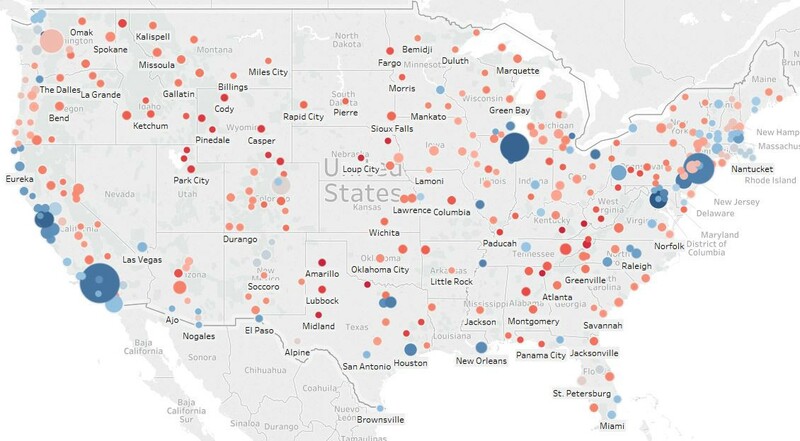 The first thing that sticks out from this visualization is that the largest protest sites were in communities with a lot of Clinton voters, including Los Angeles, Chicago, D.C., New York, Philadelphia, and the California Bay Area (though be careful not to use community-level data to make conclusions about individuals in the community). This is inconclusive but unsurprising, since major cities tend to have high concentrations of Democrat voters. And while 2 million protesters is a dramatic number in absolute terms, relatively it is less so — the 2017 Women’s March estimated crowd sizes were twice as large. If a nationwide protest involving 2 million Americans wasn’t the most newsworthy event of the day, what was? We see obvious reasons in the data why the 2018 Women’s March was less newsworthy than the prior year’s event, and perhaps why it felt less buzzworthy overall, but these reasons alone don’t explain why massive nationwide protests failed to capture widespread public interest. I looked for data that would indicate what other news topics might have been competing for public attention during this time, and why. I used Google Trends, a free service that helps you determine how “popular” different search terms are across the world and over time. While the methods Google uses to compute popularity are unfortunately opaque, we do know they standardize values somewhat like a percentage. This means we can compare search “popularity” from one community to the next, regardless of how different the population sizes may be. Here’s how popular the search term “Women’s March” was for the three weeks prior to the 2018 Women’s March, as well as one week after. You can see and interact with the chart below directly on Google Trends. Google search popularity in the U.S. for “Women’s March,” before and after the 2018 event on January 20th. Visit Google Trends for the interactive version of this chart. One observation from the data is how few people were searching for information about the march beforehand, suggesting that organizers either didn’t want much earned media build-up, or were simply unsuccessful in making that happen. Search trends before and after last year’s march showed a similar pattern, though “women’s march” search term popularity around the event last year peaked at roughly five times the level of this year’s event. If the strategy for 2018 was to keep quiet ahead of time to minimize counter protests, it seems to have come at the expense of public awareness and anticipation. Comparing Google search popularity for “Women’s March” across U.S. metro areas. Click here for the interactive chart. If we look at where in the U.S. the search phrase was more popular than others, we get another major clue about why the protests came and went relatively quietly. People living in the D.C. and New York city areas, the co-epicenters of U.S. political reporting, simply weren’t looking for information about the protests. While the marches were both a national story and a local story, there’s no denying that “beltway chatter” has an outsized influence on national political coverage. What did get a lot of people talking during this same period of time was the federal government shutdown, which began at midnight the day of the Women’s March, and was building up in the national press for several days prior. In the chart below, which you can see and interact with directly on Google Trends, we see that “shutdown” was vastly more popular of a search term before, during, and after the protest. It turns out there were a lot more people searching for “shutdown” (red line) than “women’s march” (blue line). The federal government shutdown wasn’t just a D.C. story, of course. The map at left shows the topic was popular in Google searches in most metro areas across the country, just like “women’s march” was this time last year. In other words, the federal government shutdown in 2018 captured the nation’s attention just like the 2017 Women’s March did. There’s one more event during the same period of time that also drew significantly more attention than the Women’s March did: NFL playoff games. The chart below shows that searches for “eagles” and “patriots” (the two teams that won their divisional playoff games) were substantially more popular than “women’s march,” but less popular than “shutdown” during the weekend of the protests. So if you’re looking for someone — or something — to blame for paltry news coverage of the 2018 Women’s March, where 2 million Americans took to the streets in protest, blame Congress…and the NFL. It will be interesting to see if and how the unfolding of this year’s Women’s March event changes organizers’ approach next year. Of course, next year’s march could turn out to be as much a protest as a celebration, if the current grassroots momentum leads to record numbers of women being sworn into Congress. Policy, research — exploitation, violence, human rights. Applied sociology Ph.D.